The ShareMagic™ suite of products meets the needs of most investors and traders, from young speculators just starting out in the stock market to seasoned shareholders managing family trust funds. Providing complete flexibility, the ShareMagic™ range features both online and resident databases, and both web and application tools. These can be used together or as stand-alone products. 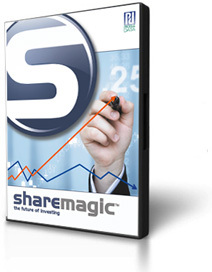 ShareMagic™ ANALYST provides a complete solution and represents the gold standard for stock market investors, giving instant access over the web plus the power of explorations, scans and analysis which are only possible with a resident database. For users who need more charting functionality than you can get in a web environment, ShareMagic™ CHART provides the powerful technical analysis capabilities of a resident time-series database. For the investor or trader who wants access to the best charting tools and detailed fundamentals and financial data – all at a reasonable price – ShareMagic™ GOLD is the answer. The best of everything and the most powerful analytical tools available. Manage an unlimited number of portfolios, build your own unique explorations, and get access to the all the information you need with ShareMagic™ ANALYST.